Today’s prize in our 24 Days of Holiday Giveaways is a $50 Restaurant.com gift card. Today’s giveaway will have two winners! Restaurant.com is a great way to save money on dining at over 100 restaurants in the Milwaukee area. Popular choices on Restaurant.com include Transfer Pizza, Motor Bar and Restaurant (at the Harley-Davidson Museum), Kil@Wat, The Pasta Tree, Wards House of Prime, and dozens of others. Restaurant.com offers $25 gift certificates for $10, although they frequently offer discount codes. Right now you can get a $25 Restaurant.com certificate for $5 using promotional code PIECE (the code is valid through today). To enter today’s giveaway for a $50 Restaurant.com gift card, visit our 24 Days of Holiday Giveaways page. 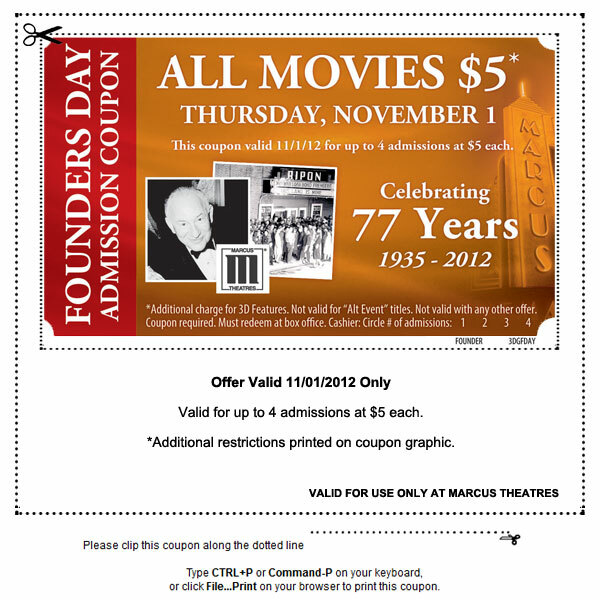 Marcus Theatres is celebrating their 77th anniversary with coupon discounts on Thursday, November 1. During the month of October, Marcus Theatres moviegoers have been presented with Founders Day coupons. If you have not been to a Marcus Theatre during October, you can print this coupon from their website. *There is an additional charge for 3D movies. The official announcement for the Founder’s Day specials can be found on the Marcus Theatres website.